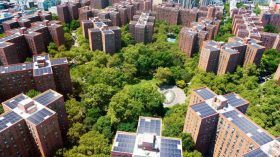 “Think of us as a 1947 Cadillac retrofitted with a Tesla engine,” says Marynia Kruk, Stuyvesant Town and Peter Cooper Village‘s Community Affairs Manager. 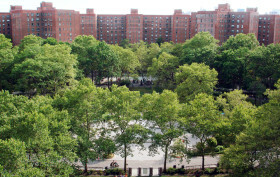 Though the 80-acre residential complex’s 110 red brick, cruciform-shaped buildings were constructed 70 years ago this month, their imposing facades are hiding an intense network of systems that, since 2011, have allowed the development to reduce its on-site carbon emissions by 6.8 percent, equal to over 17 million pounds of coal saved. To put this in perspective, that’s roughly the same savings as 3,000 drivers deciding to bike or take the train for an entire year or planting a forest of 400,000 trees. 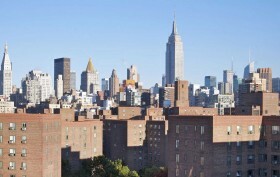 This massive sustainability push, along with new ownership (Blackstone Group and Canadian investment firm Ivanhoe Cambridge bought the complex for $5.3 billion in October 2015), updated amenities, and an affordable housing commitment, is driving Manhattan’s largest apartment complex into the future, and 6sqft recently got the inside scoop from CEO and General Manager Rick Hayduk and Tom Feeney, Vice President of Maintenance Operations, who is spearheading the green initiative. Here we go again. 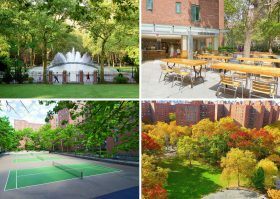 Stuyvesant Town and Peter Cooper Village on Manhattan’s east side have a long history of being an affordable option for middle-income workers. But these days its hold on that place in the city’s housing landscape appears tenuous at best. Though rent-stabilizations laws have been in effect for many units and about half are below-market rates, the remainder is comprised of luxury apartments, with one-bedroom units fetching as much as $2,900 a month, more than double the rate in 2006 when nearly ¾ of the units were below market. And with the property poised to sell for billions of dollars, the trend towards more luxury rentals seems likely.